Happy hump day, friends! You know I love me some sales and sharing them with you all, and an exciting one is happening now at the candyland of makeup stores, Sephora! Today, I’m sharing all my favorite Sephora Must-Haves, and the Beauty Insider Appreciation event started this weekend for VIB Rouge members and it will open up to VIB and Beauty Insider members this week! If you aren’t a Beauty Insider yet, I highly recommend you sign up – it’s free, and you earn points with every purchase that you can cash out for beauty rewards! The more you spend throughout the year, the higher Beauty Insider status you’ll have (and more rewards/perks you’ll receive). Plus, you always get a little gift during your birthday month! 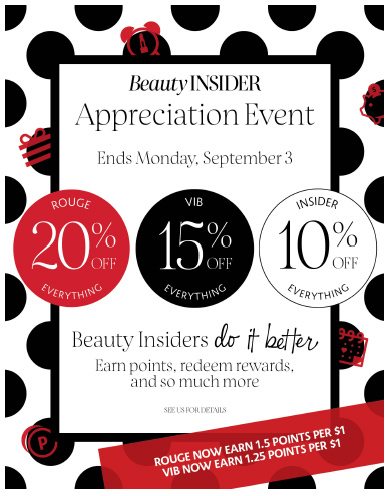 VIB Rouge members get to shop the sale starting today (they receive 20% off their purchase with code YESROUGE), and then the sale will open up to VIB and all Beauty Insiders on Thursday, August 30th. VIB members receive 15% off their purchase with code YESVIB, and Insiders receive 10% off with code YESINSIDER! The sale goes on until Monday, September 3rd – so act fast! Sometimes really popular products run out of stock during these sales, so if you have you’re eye on something, don’t sit on it! Sephora has an awesome return policy if you don’t end up loving the product. It’s an ideal time to stock up on your favorite makeup/skincare/hair products/fragrance, since the brands Sephora carries only go on sale during these rare events (1-2x a year)! If you are looking to try some new products out, my tried and true favorites that I recommend you trying out are below. These products don’t have a drugstore price tag, but the ones I listed here are worth it! High quality products, with high quality results. L’Occitane Shower Oil: My dry skin is obsessed with this stuff! Works as a body cleanser and doubles as shaving cream, which I indeed use for shaving my legs! I feel like it prevents razor burn more than any other shaving cream I’ve tried. Caudalie Instant Detox Mask: I love Caudalie skincare products because they work, and they use clean ingredients (so important during pregnancy!). I’ve been using this mask over the past year and it’s definitely a skincare must-have for me. It draws out accumulated toxins from clogged pores to revitalize your complexion. Sold! Coola Sunless Tan Serum: I get questions all the time if I use my body self tanner on my face, and the answer is no – but I do use this sunless tan serum to match my face to my body! It works really well. I use it about 1-2x a week. Bonus, it’s also made of clean ingredients and is anti-aging. Caudalie Beauty Elixir: Definitely more of a luxury product, but I can’t live without it! It’s a toning mist that tightens pores, sets makeup, and provides an instant shot of radiance to the skin. I also love spraying it before I apply moisturizer. Smells so good and clean! Made of all clean ingredients as well! Living Proof Dry Volume Blast: Does your hair lack body and volume? This stuff is a miracle worker for me! I am not great at teasing my hair, so I really had trouble achieving any sort of body or volume in my hair, until this guy came along! Smells great too, and a little goes a long way. Coola Dawn Patrol Makeup Primer: I’ve tried tons of primers that I apply before my foundation, and I haven’t found one I like better than this one! The best part is that the ingredients are clean and it provides your face with SPF 30. Yay! Beauty Blender: I’m sure everyone and their mother has heard of the beauty blender by this point, but it’s highly raved about for a good reason! It applies my makeup more flawlessly than any foundation brush or my fingers. Definitely lives up to it’s hype, and does not compare to the drugstore sponges that are $3. I promise you that! The only annoying thing about it is that you have to clean it and replace it frequently. Estee Lauder Double Wear Foundation: All time favorite foundation – NOTHING has been able to outdo this foundation for me! I’ve used it 3+ years and it’s still the best ever. And I’ve tried a lot. Trust! Longest wearing and most flawless looking foundation ever. T3 Cura Hair Dryer: Expensive, yes… but nothing dries my hair has fast as this hair dryer. I also get less frizz from this dryer compared to others. A great time to get it while it’s on sale! T3 Twirl Convertible 1.25″ Curling Iron: My everyday, go-to curling iron. If my hair is curled, I likely used this one. I also love T3’s curling wands and larger barrels, but this one is my #1. Laura Mercier Translucent Setting Powder: This was my favorite setting powder a few years back, and I ended up trying some other powders for fun for a while and came back to this one recently. Umm wow, not sure how I didn’t pay close enough attention before, but this one is the best out there! No cakey-ness, keeps oil at bay, and keeps my makeup looking fresh all day. Lancome CILS Booster Mascara Base/Primer: Came across this gem just the past month after I removed my eyelash extensions, and wow it’s good! It really helps prevent mascara flakes (hate) and give the best mascara application possible. Check out the raving reviews! Benefit Roller Lash Mascara: I’m pretty picky with mascara, but I sure love this one! Lengthens, separates well, and helps curl your lashes. NARS Laguna Bronzer: Favorite bronzer for the ultimate sunkissed, healthy glow! This is award-winning and loved by so many. I’ve been repurchasing it for 3+ years. Invisi Bobble Hair Rings: How did I live without these things?! They are so much more gentle on my hair, and I’ve noticed less breakage since using them. They also work really well for messy buns! Hourglass Ambient Lighting Powder in Luminous Light: Gives your skin such a beautiful, natural, healthy glow! I wore this on my wedding day and have been using it ever since. The full size lasts forever so the price is totally justified. It’s gorgeous! Chanel Chance Perfume: This is my signature scent for nights out and special occasions. Every friend that has asked about my perfume has become obsessed with this stuff. It smells very luxe, fresh and zesty. A little goes a long way, and the scent will last all day/night. YSL Tatouage Couture Liquid Matte Lip Stain in 7 Nu Interdit: I’ve shared my love for this lip color and product in a previous post this summer, and yes, still obsessed. Favorite go-to, everyday lip color. Non-sticky or drying, just perfect. YSL All Hours Concealer: Favorite concealer of all time! Covers my dark circles, keeps my under eyes hydrated and crepe-free. Benefit Precisely, My Brow Pencil in #4: I always go back and forth between this one and the Brow Wiz, but I honestly receive the most compliments on my brows when I use this one. And it’s a lot more pigmented than the Brow Wiz. Stila Stay All Day Liquid Lipstick in Baci: I have this liquid lip in a few colors (Baci, Carmello, Biscotti) – it’s a great long-wearing lip color! And I love the shades. Baci is my favorite shade and the one I get the most use out of. Urban Decay Eyeshadow Primer Potion: So long are the days that I put on eyeshadow without eyeshadow primer! It’s crazy what a difference it can make. I love this one! Urban Decay Naked2 Basics Palette: Looking for a neutral, matte, everyday eyeshadow palette? Found it! I use this palette most in the fall and winter and save my shimmery shades for the spring and summer. Marc Jacobs Eyeshadow Palette in Glambition: If I’m traveling, I’m likely taking this palette with me. It has a beautiful range of neutral shimmer and matte shades that can take me from day to night. Below are the products that I’ll be purchasing during the sale that I haven’t tried yet, but have heard amazing reviews on! I think I’m most excited for the Foreo LUNA Mini 2 and the Olaplex hair treatment! What will you be picking up from the sale? 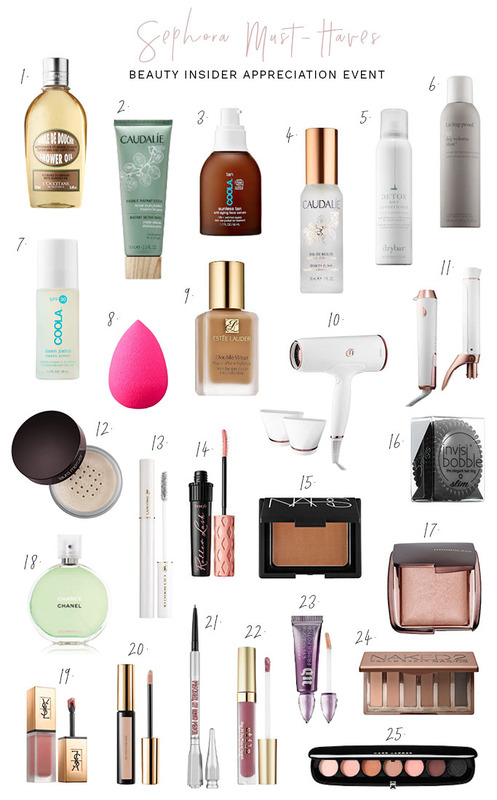 Do you have any must-haves that aren’t on my list (that I need to give a try)?! I would love to hear from you! I keep hearing about the Laneige lip mask! I think I’ll have to try it too 🙂 Thanks so much for sharing your favorites!